Healthy hair that feels and looks great is a goal that just about everyone has. It is especially important that your hair is pretty and manageable on your big day. There are several things that you can do to improve the health of your hair. Argan oil is rich in vitamin E and fatty acids. It is ideal for frizzy or dry hair. Coconut oil is rich in nutrients and carbohydrates. You can use it on all hair types. Macadamia oil offers very intense hydration. It is a good choice for hair that is extremely damaged or dry. Almond oil is rich in vitamin E, protein, antioxidants, fatty acids, and magnesium. It is a good option for fighting dandruff. Kalahari melon-seed oil is rich in protein, vitamin B2, omega-6 fatty acids, and vitamin C. This oil is gentle for sensitive skin. Baobab oil provides deep hydration and encourages hair elasticity. It is a good option for increasing hair growth. Abyssinian oil is lightweight and very hydrating. This oil is well-suited for fine hair. Marula oil is rich in antioxidants. It is used for protecting hair from the sun. If your hair is oily, you may need to wash it more often. Always use conditioner after every shampoo. Concentrate your shampoo on your scalp. Choose a conditioner and shampoo formulated for your type of hair. Look for products that use minimal chemicals and more natural ingredients. Drink plenty of water to ensure that you are hydrated. Minimize heat styling, and use a heat protector when you do use hot tools. Limit how often you wear tight hairstyles. Keep your hair trimmed to prevent split ends. Try to avoid chemical treatments, especially in the hot summer months. When you are in a pool, wear a swimming cap to protect your hair from chlorine. Niacin is a B vitamin that is important for ensuring that the hair follicles have adequate nutrients and oxygen since it improves blood circulation. This ensures healthier hair from the root. Vitamin A ensures that your hair has enough natural oil for health and hydration. This nutrient also promotes hair growth. Biotin is another B vitamin that improves hair health and growth. In fact, hair loss is a symptom of a biotin deficiency, so it is important to get enough. Vitamin C is an antioxidant, and it helps your body properly absorbs iron. Both factors contribute to hair strength and growth. Vitamin D helps to protect your hair. It is also believed to promote hair growth. Vitamin E is another antioxidant. It helps to enhance shine and growth. It also plays a role in preventing oxidative stress. Zinc is important for the hair follicles and oil glands to function properly. This mineral also helps with hair repair and growth. Protein is critical for optimal hair growth. It also promotes stronger hair. Rosemary: This herb helps to boost growth. The antioxidant content protects against thinning and damage. This herb also promotes shine and alleviates scalp irritation. Nettle: The astringent properties help to reduce scalp oil and volumize your hair. This herb also boosts strength and hair growth due to its nutrient content, including vitamins C, A, and K, iron, omega-3 fatty acids, pantothenic acid, and silica. Amla: This herb has potent conditioning properties to add shine, moisture, and healthy texture. Fenugreek: This aromatic herb is rich in vitamin C and protein to ensure that hair is strong. It also has potent anti-inflammatory and antioxidant properties. Aloe vera: This plant helps to soothe the scalp. It also promotes volume and hair thickness. Horsetail: This herb is rich in silica, helping to promote greater shine and strength. It may also protect against split ends. Bhringraj: This herb is helpful for protecting against hair graying and aging. It makes hair softer and thicker, too. Marshmallow root: This herb helps to nourish dry hair and dry scalp. It makes hair more flexible to help prevent frizz. Brahmi: This herb works to nourish the hair follicles for healthier hair growth. It also promotes stronger strands. Before using any herbs or other supplements, talk to your doctor. This is important to ensure safety. Then, once you choose which healthy-hair methods you will use, simply be consistent to reap the benefits. 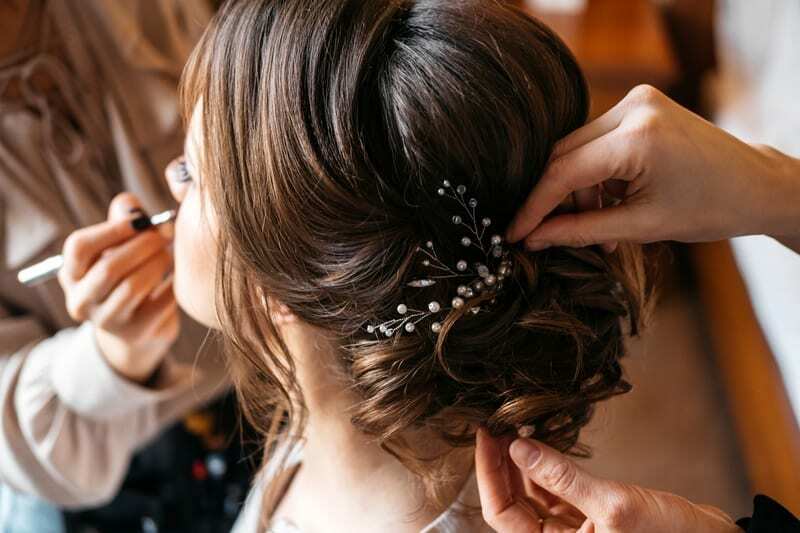 And then on your big day, you’ll be bound to have beautiful hair ready to style.